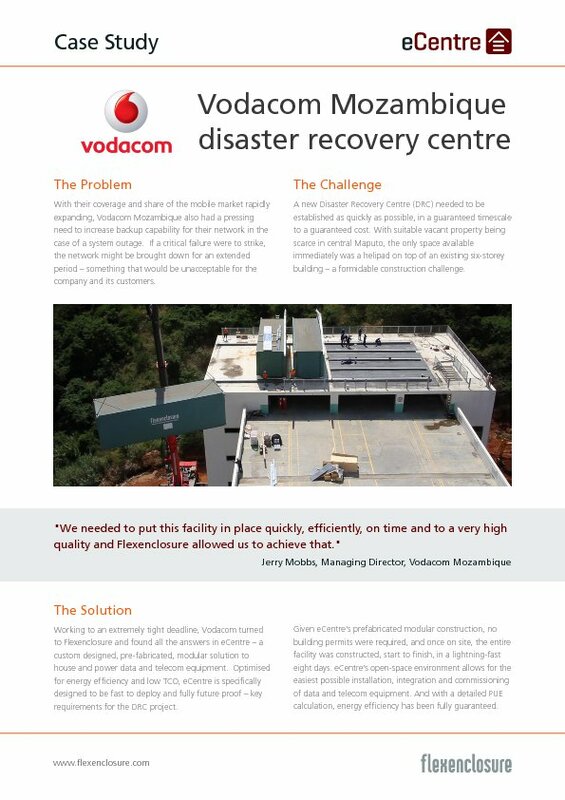 Vodacom needed to establish a new disaster recovery data center as quickly as possible, in a guaranteed timescale to a guaranteed cost. With suitable vacant property being scarce in central Maputo, the only space available immediately was a helipad on top of an existing six-storey building – a formidable construction challenge. With their coverage and share of the mobile market rapidly expanding, Vodacom Mozambique also had a pressing need to increase backup capability for their network in the case of a system outage. If a critical failure were to strike, the network might be brought down for an extended period – something that would be unacceptable for the company and its customers. A new Disaster Recovery Centre (DRC) needed to be established as quickly as possible, in a guaranteed timescale to a guaranteed cost. With suitable vacant property being scarce in central Maputo, the only space available immediately was a helipad on top of an existing six-storey building – a formidable construction challenge. Working to an extremely tight deadline, Vodacom turned to Flexenclosure and found all the answers in eCentre – a custom designed, pre-fabricated, modular solution to house and power data and telecom equipment. Optimised for energy efficiency and low TCO, eCentre is specifically designed to be fast to deploy and fully future proof – key requirements for the DRC project. Given eCentre's prefabricated modular construction, no building permits were required, and once on site, the entire facility was constructed, start to finish, in a lightning-fast eight days. eCentre's open-space environment allows for the easiest possible installation, integration and commissioning of data and telecom equipment. And with a detailed PUE calculation, energy efficiency has been fully guaranteed. Flexenclosure delivered a guaranteed product, with guaranteed energy efficiency, in a guaranteed time, at a guaranteed price. The facility is expandable as Vodacom's network expands and crucially without any operational interruption. Flexenclosure's right-sized modular buildings allow for fully customised floor plans, optimised for specific customer requirements. Maximum preparation and testing in the factory guarantees minimum work on site, even for the most complex turn-key projects. And with extensive experience deploying technical facilities in the most challenging environments in more than 50 countries, Flexenclosure brings creative ideas, fully tested solutions and total peace of mind … fast.